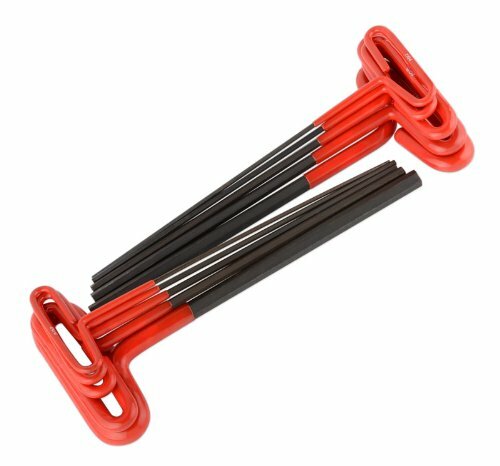 The ball end on these hex keys make it easy to reach hex fasteners from an angle. 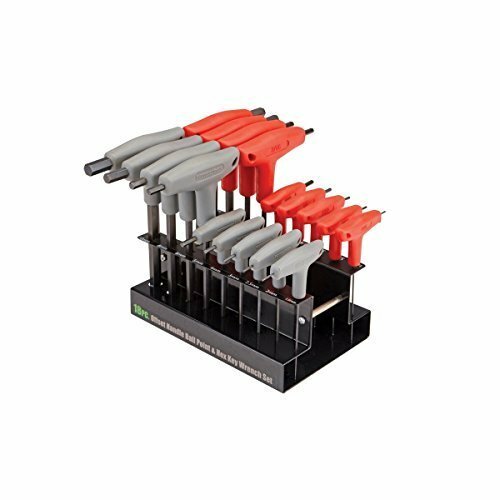 Each wrench in this hex set includes long (ball point) and short (standard hex key) to handle a variety of jobs. WLMW80275 Features: -High quality carbon steel shafts. -PVC T - Handles for added torque and comfort. -Handy storage rack. 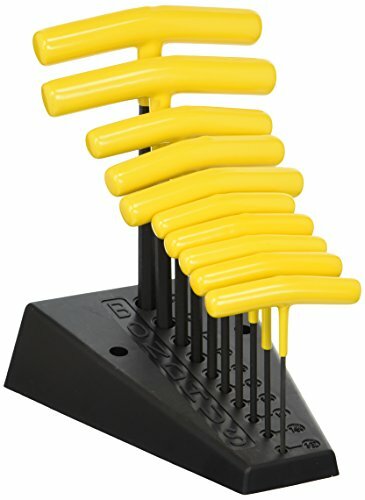 -10 Piece Metric T-Handle Hex Key Set. Product Type: -Hex. Dimensions: Overall Length - End to End: -9 Inches. Overall Width - Side to Side: -8.2 Inches. Overall Product Weight: -2.8 Pounds. Heat treated extruded alloy steel. Black oxide finished for durability. T-handle design increases turning power and provides a sure comfortable grip. Wrench sizes: 3/32", 7/64", 1/8", 9/64", 5/32", 3/16", 7/32", 1/4", 5/16", 3/8". 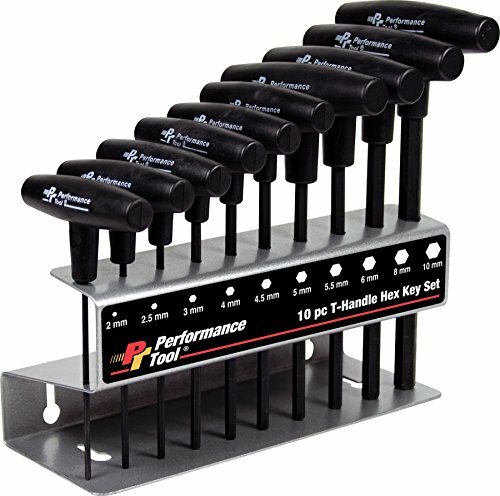 10 piece Metric T-Handle Hex Key Set features plastic handle grips for comfort and increased turning power. The shafts are made from high quality steel. The set includes: (1) 2mm, (1) 2.5mm, (1) 3mm, (1) 4mm, (1) 4.5mm, (1) 5mm, (1) 5.5mm, (1) 6mm, (1) 8mm and (1) 10mm. Ekl53168 features: -high quality, industrial grade, professional set. -Made with Eklind alloy steel. -Heat treated for optimum strength and ductility. 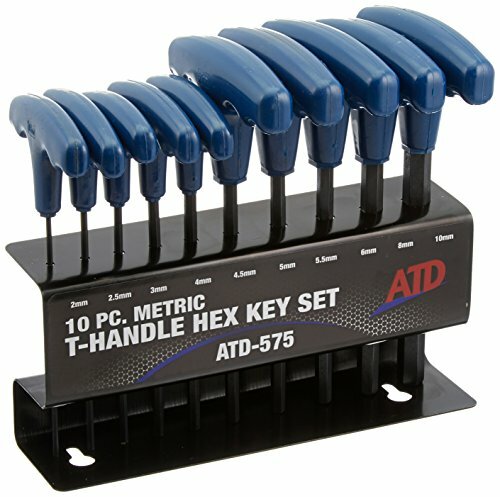 -8 piece 6'' cushion grip SAE hex t-key set. Product Type: -hex. Dimensions: overall Length - end to end: -8.3 inches. Overall width - side to side: -4.5 inches. Overall product weight: -0.95 pounds. The Allen 56660G 8 Pc. 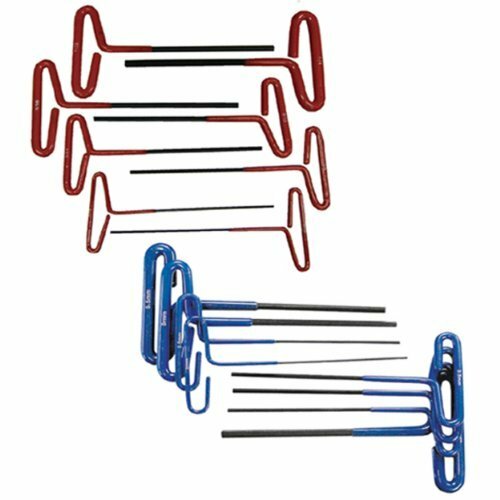 Metric Ball-Plus T-Thru Handle Set includes the following sizes: 2, 2.5, 3, 4, 5, 6, 8, 10. 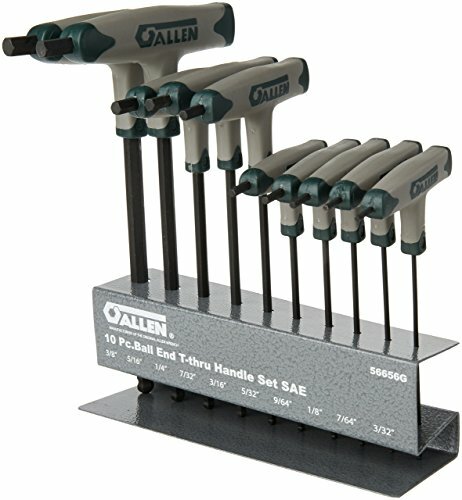 The Allen 56656G 10 Pc. 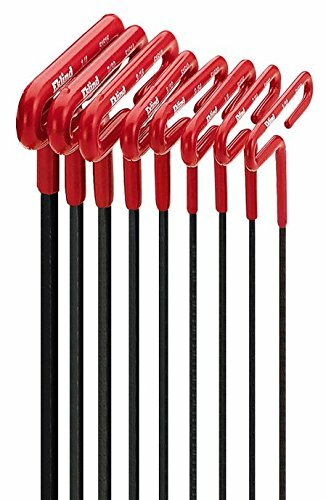 SAE Ball-Plus T-Thru Handle Set includes the following sizes: 3/32, 7/64, 1/8, 9/64, 5/32, 3/16, 7/32, 1/4, 5/16, 3/8. This is our favorite hex wrench style; the broad handle lets you apply serious torque much more easily then L-style keys. Plus the long shaft has saved us much time and frustration reaching screws and bolts 'hidden' by design engineers. Metric 2, 2.5, 3, 3.5, 4, 5, 5.5, 6, 8, 10mm; SAE 3/32, 7/64, 1/8, 9/64, 5/32, 3/16, 7/32, 1/4, 5/16, 3/8". See-through vinyl pouches; super-easy to store for quick access - all 20 wrenches fit in four 1" holes/slots. Also available in SAE or Metric separately. 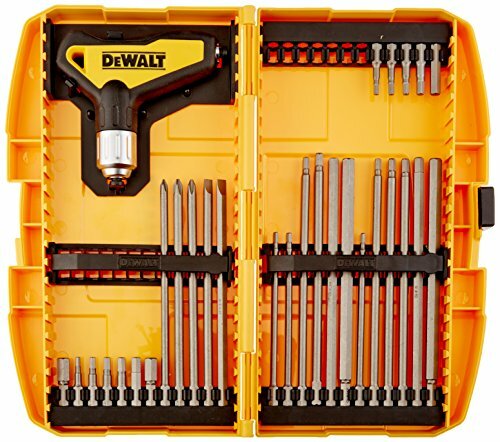 Dewalt Ratcheting T-Handle Set, 31 Pc. Dewalt. DWHT70265. 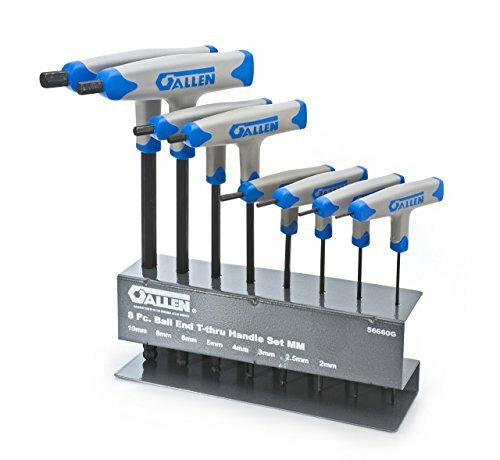 Compare prices on Allen Key Set T Handle at ShoppinGent.com – use promo codes and coupons for best offers and deals. Start smart buying with ShoppinGent.com right now and choose your golden price on every purchase.